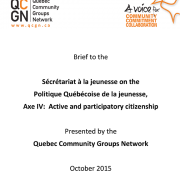 Founded in 1995, the QCGN is a not-for-profit organization linking more than 56 English- language community organizations across Quebec. 3) The vitality of the English-speaking community of Quebec does not threaten French in Quebec. The Official Languages Act is a lifeline for English-speaking Quebec. The Act is the only language rights legislation that protects the interests of English-speaking Quebecers as a community. The Act sets out quasi-constitutional rights for English-speaking Quebecers, including the right to access federal services in English, the representation of English-speakers in the federal public service, and the right to work in English in the federal public service. Further, the Act provides the framework for much-needed financial support for the community’s institutions and networks. In this brief, the QCGN presents proposals for a modernized Act. 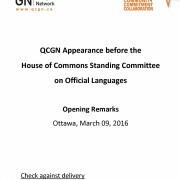 In this brief to the House of Commons Standing Committee on Official Languages for a study on the Full Implementation of the Official Languages Act in the Canadian Justice System, QCGN expressed support for a Supreme Court of Canada appointment process that is transparent, inclusive, and accountable to Canadians. The brief also states there must be a systemic capacity for justices to hear cases and render decisions in both official languages and that the language skills of judges must be sufficient to ensure the evolution of Canadian law. 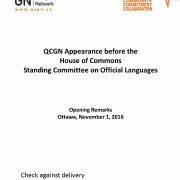 Opening remarks from the QCGN appearance at the LANG committee in Ottawa on November 1, 2016. 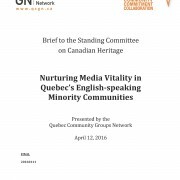 In a brief to the House of Common’s Standing Committee on Canadian Heritage for its study on The Media and Local Communities the Quebec Community Groups Network presented a series of pragmatic, cost-effective steps designed to rapidly help restore the vitality of news media serving the province’s English-language community. 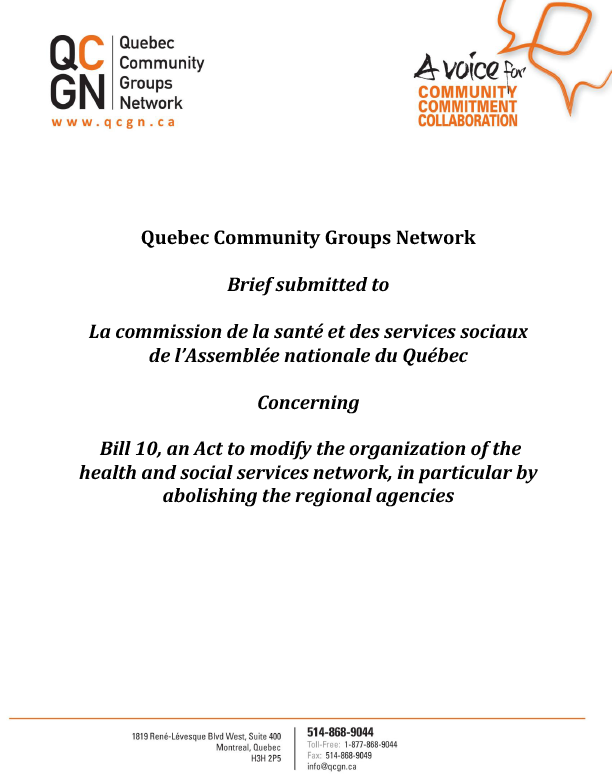 The QCGN proposed cooperative ventures, including the creation and growth of English-language community media hubs to serve outlying regions starved of local content. 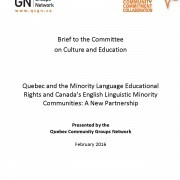 In opening remarks to the to the Standing Committee on Official Languages the Quebec Community Groups Network encouraged parliamentarians to find ways to make support for Canada’s English and French linguistic minority communities flexible and responsive the unique needs of each community. 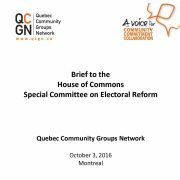 In a brief to the National Assembly’s Committee on Culture and Education studying Bill n°86 : An Act to modify the organization and governance of school boards to give schools a greater say in decision-making and ensure parents’ presence within each school board’s decision-making body, the Quebec Community Groups Network argued the proposed legislation tramples on minority rights and should be scrapped. 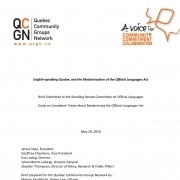 The QCGN stated that the provincial English public school system is a key community institution and that the bill violates the constitutional rights of Quebec’s English-speaking community to control and manage its own schools.  In its brief to the provincial youth secretariat hearings on Quebec’s youth policy, the Quebec Community Groups Network argued that a targeted approach reflecting their specific needs as a minority is crucial for provincial youth programs and policies to have an effect on Quebec’s English-speaking youth. 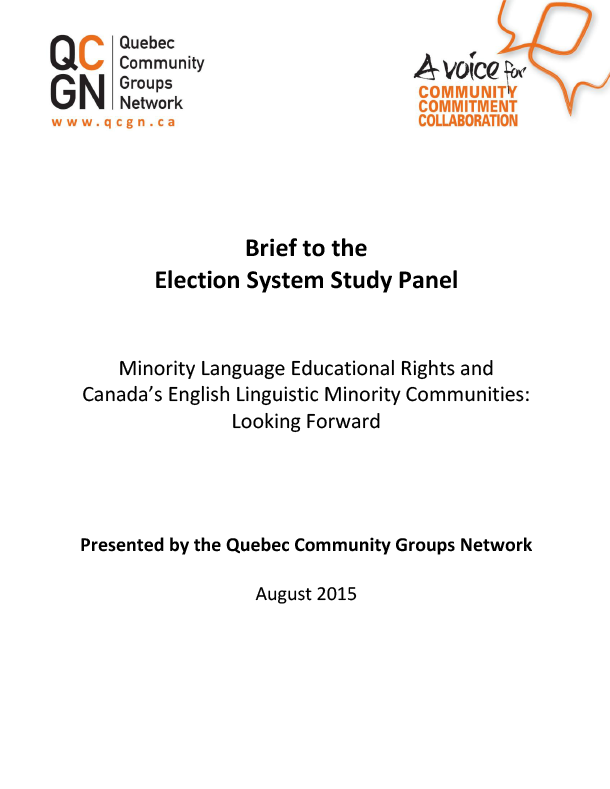 In a brief to the panel examining the possible application of a new system for school board elections, the Quebec Community Groups Network goes over constitutional rights of English-speaking Quebecers as they pertain to the control and management of minority language school boards. In its presentation to the National Assembly committee studying Bill 10: an Act to modify the organization of the health and social services network, in particular by abolishing the regional agencies, the Quebec Community Groups Network presented detailed arguments on how the proposed legislation not only threatens the health and social service institutions of Quebec’s English-speaking community that are key to its ability to survive and thrive, it eliminates them.